The first use of the term “suspended pavement” (to the writer's knowledge) is from a study published in Arboriculture & Urban Forestry in July 2006 by E. Thomas Smiley, Lisa Calfee, Bruce R. Fraedrich, and Emma J. Smiley titled “Comparison of Structural and Noncompacted Soils for Trees Surrounded by Pavement.” In this study, the authors set up a plot of trees – a mix of Snowgoose cherry (Prunus serrulata) and Bosque lacebark elm (Ulmus parvifolia) – growing in 5.4m3 (189 ft3) of five different soil treatments: compacted soil, gravel/soil mixture, Stalite, Stalite/soil mixture, and suspended pavement. Nine years later, the difference in performance between trees planted in suspended pavement and trees planted in the other treatments remained very apparent. This study is discussed in more detail in the “Where Is Suspended Pavement Being Used?” section further down. You can also view photos of the study over the last nine years here. Access to usable soil is the most limiting factor for urban tree growth, and few street trees have access to soil beyond what is provided in their opening. This is a common reason why street trees often do not grow to maturity, or simply fail to thrive. Rooting space becomes limited due to soil compaction that results from paved surfaces/high pedestrian traffic above rooting space. Suspended pavement systems address this problem by creating underground rooting areas beneath paving, allowing lightly compacted, high-quality soils to be stored and made available for tree roots in cities and other heavily paved environments. With access to adequate amounts of high quality soil, growing mature, healthy, long-lived trees in heavily paved environments becomes possible. Properly designed, this technology enables us to grow forest size and quality trees even in urban areas. Healthy, mature trees provide significant stormwater benefits, and suspended pavement systems provide opportunities for integrated stormwater/soil benefits. If suspended pavement systems are filled with a bioretention soil mix, about 20 percent of their volume can be used for stormwater storage (in 1,000 cubic feet, 200 cubic feet of water can be stored). Rain water can be directed in to suspended pavement systems in order to keep it on-site, making it available for plant growth and preventing it from overflowing sewer systems or polluting nearby watersheds. There are many ways to do direct water in to the system, including pervious pavers, curb cuts, catch basins, slot drains, and more. A typical tree in suspended pavement can hold the 2.54 cm (1 inch) storm event from impervious surface area significantly greater than just the area under the tree canopy. Soil Storage: Soil stores rain water during and after a storm, making it available for plant growth. Stormwater runoff from nearby impervious surfaces can be directed into soil under suspended pavement using a number of different techniques, such as, for example, through pervious pavement installed over the cells, or via a perforated pipe off a trench drain or manhole. Interception: Interception is the amount of rainfall temporarily held on tree leaves and stem surfaces. This rain then drips from leaf surfaces and flows down the stem surface to the ground or evaporates. Since larger trees have more leaves to intercept rain, they intercept significantly more rain than small trees, with interception increasing at a faster rate than tree age. Evapotranspiration: Evapotranspiration (ET) is the sum of water evaporated from soil and plant surfaces and the water lost as a result of transpiration, a process in which trees absorb water through their roots and transfer it up to the leaves, where it evaporates into the environment through leaf pore transpiration. Evapotranspiration continues to reduce stormwater volume stored in the soil long after a rainfall event ends. A recent performance monitoring study at North Carolina State University shows that Silva Cell systems (a soil cell suspended pavement system) performed better or about equal to the mean for bioretention systems in peer reviewed literature for total suspended solids [TSS] and heavy metals. This means that Silva Cell (soil cell) systems, which use trees and soils to capture and clean stormwater under paving, are viable design solutions to provide stormwater management in ultra-urban areas. The Silva Cell system meet AASHTO HS20 loading standards and is particularly useful in densely developed conditions where space does not allow for traditional (open) bioretention. For further details on this study, read more here. Where is Suspended Pavement Being Used? This independent study (also discussed above) was set up by Dr. Tom Smiley at the Bartlett Tree Laboratory to test how well trees fare in different growing media. The trees are monitored and tracked from year to year to measure their branch extensions, height, diameter at breast height (DBH), leaf count, and more. The research plots were set up with 12 trees planted in a suspended pavement system, 12 trees planted in a stalite/soil mix, 12 trees planted in compacted soil, 12 trees planted in pure stalite, and 12 trees planted in a gravel/soil mix. All trees had access to 189 ft3 of growing medium. 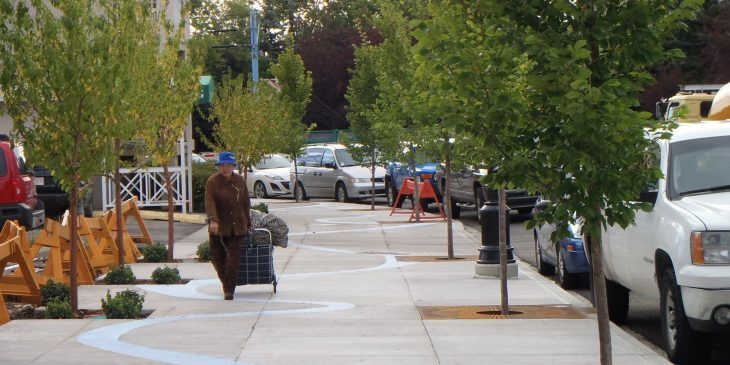 By all measurements, the trees in the suspended pavement treatment are outperforming all the others in size, color, trunk diameter growth, twig growth, chlorophyll rating, and root growth. This study is now entering its tenth year, and Dr. Smiley is expected to publish an updated paper sharing the results in the coming years. The Christian Science Center, on Huntington Ave between Mass Ave and Belvidere Street in Boston, is the oldest suspended pavement installation that we know of in the United States. These trees were planted in 1968, making them 46 years old. Sasaki & Associates designed this suspended pavement system as a long soil trench made up of structural slabs resting on grade beams over a garage roof. Each tree has access to around 800 cubic feet (22.6 cubic meters) of soil. In 2011 this plaza was designated with Landmark status by the Boston Landmark Commission. In 1985 Charlotte, NC City Arborist Don McSween conceived of a major renovation project along 10 blocks of Tryon Street and two blocks of Trade Street, two of the major thoroughfares in downtown Charlotte. McSween wanted each new tree to have 1,000 cubic feet (28 cubic meters) of good, usable soil. In order to supply the trees with that quantity the City needed to create a custom suspended system using precast concrete pavement supported by concrete piers. The whole system was topped by pavers (not pervious). Almost 170 trees were planted. The trees flourished. In 2009, while investigating some trees that weren’t doing so well, Tom Smiley with the Bartlett Tree Lab discovered that the contractor had actually only installed about 700 cubic feet (20 cubic meters) of soil per tree. However, since the tree pits connected along the length of a block with multiple trees in each pit, they had the benefit of sharing soil (link to: http://www.deeproot.com/blog/blog-entries/the-benefits-of-soil-sharing-for-trees-2). Today, the Willow Oaks (Quercus phellos) have an average DBH of 16 inches (40.5 cm) and an average height of 44 feet (13.4 meters). These trees are planted in a large, shared, subsurface planter that rests on an underground parking garage. As of 2013, these trees look wonderful, providing a popular refuge from the elements in the heart of New York City. The most commonly used suspended pavement product (and the one used in the studies and projects referred to in the above text) is the soil cell. Soil cells are a modular subsurface composed of structural units that form a skeletal matrix which can then be installed under paved surfaces and filled with large volumes of soil to support healthy root growth. They are designed to support the growth of large trees and to help with stormwater management. Soil cell designs can support both sidewalks and road surfaces of greater widths than continuous trench designs without compromising the structural integrity or the ability to conduct underground maintenance activities. The depth and layout of the soil volume can cover an irregular area. This increases flexibility in terms of creating appropriate tree habitat in constrained areas. The structure shall be designed to support loads up to and including AASHTO H-20 and Relevant Ontario Building Code standards for sidewalks. The structures shall be designed to be filled with the growing medium as specified in section 32 91 21 “Growing Medium” including the type of soil specified; the required limitations of delivery, storage, and handling; the requirement to retain soil peds; and requirements to compact and in-situ test soil compaction to the ranges specified. The soil cells shall have been specifically designed and tested for the purpose of growing tree roots, and rainwater filtering, detention and retention. Critical to the soil cell design is that each soil cell or stack of soil cells shall be structurally independent of all adjacent soil cell stacks such that a single stack or group of stacks can be removed after the completion of installation to facilitate future utility installation and repair. The structural design of each Soil Cell unit shall facilitate the movement of roots and water between each cell and between the edges of the cell system and the surrounding soils. The design shall facilitate the installation, compaction and in-situ soil compaction testing; installation and maintenance of utilities within and under the soil cells; the movement and expansion of roots; and the lateral capillary movement of water. Craul, P.J. 1992. Urban Soil in Landscape Design. John Wiley and Sons, New York, NY. Smiley, E. Thomas, et al. July. 2006. Comparison of Structural and Noncompacted Soils for Trees Surrounded by Pavement. Arboriculture & Urban Forestry.